As one of the thought leaders in the personal technology space, 91mobiles has taken the onus of understanding and analysing consumer expectations, and matching them to what brands have in their current and future portfolios. 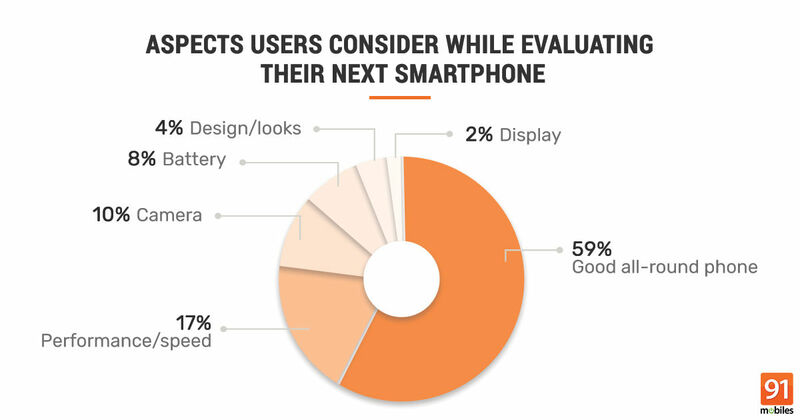 The latest effort in this quest comes in the form of the 91mobiles Smartphone Buyer Insights Study 2019, which aims to unearth insights related to how often users upgrade their phones, what matters most to them while selecting a new daily driver, how they research for handsets, and their preferred buying modes and price ranges. 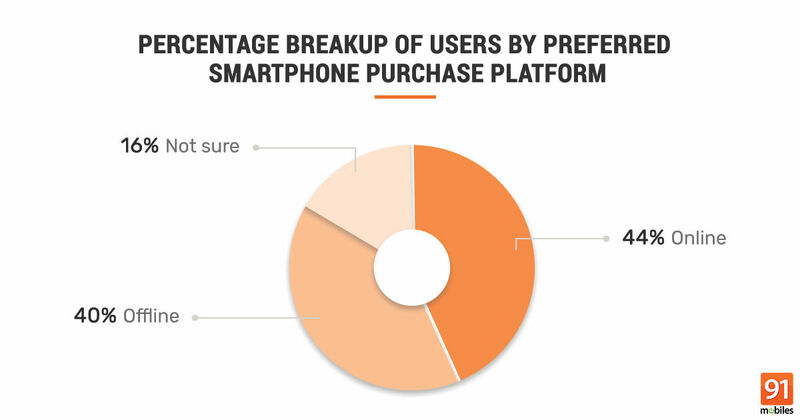 The study analysed responses from over 15,000 users, and with 78 percent of them planning to acquire a new handset in the coming months, is representative of a large set of prospective smartphone buyers who are all quite opinionated on what they want from their next device. The findings have further been spliced and analysed based on demographic factors like age, gender and location, resulting in interesting highlights that are a true indicator of what users want. The full report is embedded below, while all the key insights are listed next. 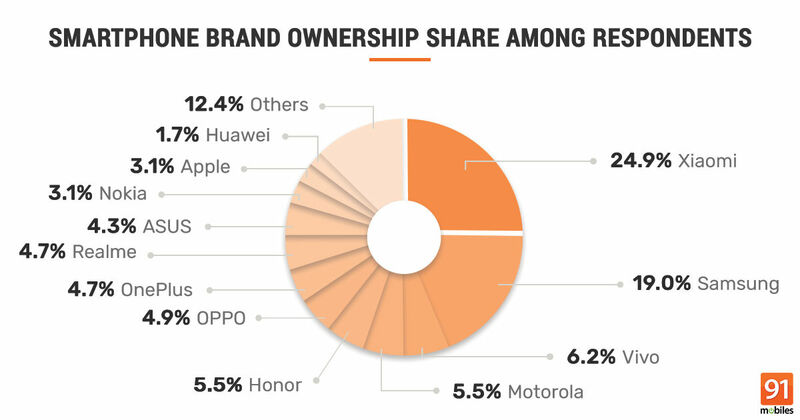 The current ownership patterns reflect the market standings of brands, with Xiaomi leading the game (with a share of 24.9 percent), and Samsung coming in second (with a share of 19 percent). Vivo is a distant third, with 6.2 percent share. Motorola, Honor, and OPPO follow with 5.5 percent, 5.5 percent and 4.9 percent share respectively. OnePlus and new entrant Realme sit at seventh spot, with a share of 4.7 percent each. 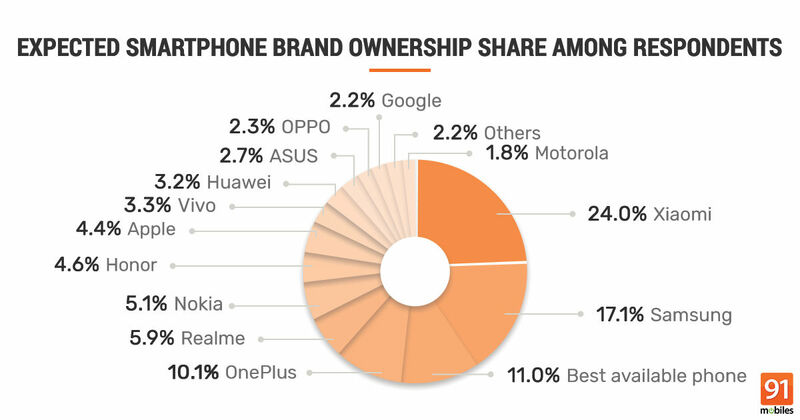 Interestingly, new brand Realme’s share among the respondents is higher than established players like ASUS (4.3 percent) and Nokia (3.1). This just goes to show how quickly Realme has ramped up and managed to capture consumer mindshare. Realme, which began its journey as a sub-brand under OPPO, was spun off as a separate entity and has been introducing high-specced phones priced attractively, which explains its fast growth in the highly competitive smartphone segment. When the responses are split by age, it emerges that Xiaomi and Realme smartphones are more popular among younger people, while Samsung, OnePlus and ASUS are more preferred by older folks. When the data for current ownership is divided by location, we notice that Xiaomi, Samsung and OPPO are not as popular in the South compared to other regions. However, OnePlus and Motorola do seem popular among users in the South. Dividing the current ownership patterns by gender, it appears that brands like Xiaomi, Samsung, Vivo and OPPO are the ones more preferred by women. Other brands like OnePlus, Honor, ASUS, Motorola and Nokia are more preferred by men, as the percentage share of their male users is higher. Dividing the data by occupation, it seems that Xiaomi and Realme have a higher number of users that are students, as compared to those who’re working. For Samsung, OnePlus and Motorola however, it’s the other way around. We asked respondents about the smartphone brands they’re likely to choose when they upgrade their handsets next. Looking at the data on the smartphone brands respondents want to migrate to, Xiaomi, followed by Samsung, still lead the pack, though their share seems to be dropping slightly. A good 11 percent respondents have said they don’t have any specific brand preferences, and will buy the best available phone that fits their budget. 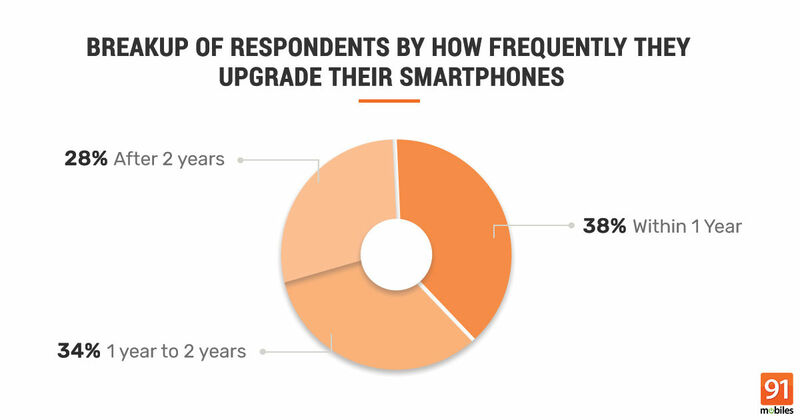 Almost 40 percent of respondents said they upgrade their smartphones within one year, while 34 percent upgrade between one to two years. 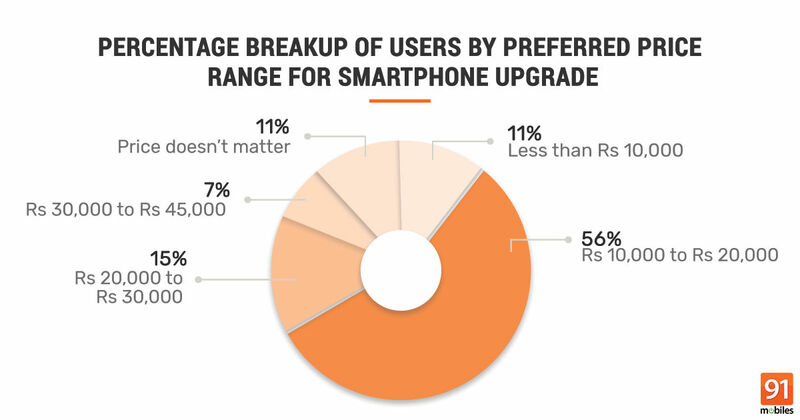 About 28 percent users said they upgrade their handsets after two years. No wonder India is a booming market for smartphones, considering a large majority of users switch to newer phones within just a year. Smartphone brands of course, are happy to make use of the opportunity this presents, and therefore, keep launching new options very frequently to satiate the demand. Younger people (below 35) upgrade their phones more frequently than those above 35, and older folks generally seem to be more conservative. 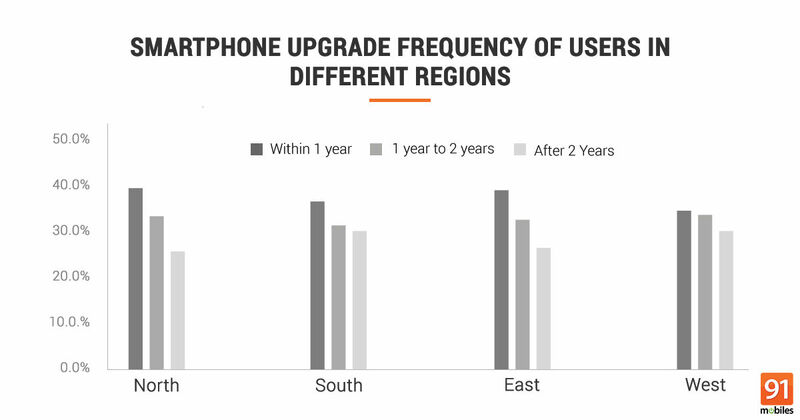 As far as the same data divided by location, people in the North and East upgrade their smartphones more frequently than users in other regions. Men upgrade their smartphones more frequently than women (~40% men upgrade within a year, vs 30% women). Among those upgrading their smartphones within 1 year, the share of students is marginally higher than working people. Of those that upgrade to a new smartphone within 1 to 2 years, the share of working people is higher than students. The next set of insights are related to the preferred price range for smartphone purchase, how users go about finding more info on new devices and their choice of platforms for buying (online vs offline). Based on the responses, it appears that most users (over 56 percent) plan to buy phones priced between Rs 10,000 to 20,000. About 15 percent are looking for phones priced between Rs 20,000 to Rs 30,000. The price band which can be considered relevant for the so-called affordable flagships is the Rs 30,000 to Rs 45,000 bracket, and this seems to interest about 7 percent of the users. Worth noting that this is the price band where the likes of OnePlus play in. As far as the budget segment is concerned, about 11 percent respondents said they’d like to opt for phones priced below Rs 10,000. This price bracket used to be the most voluminous in the Indian smartphone market at one point, but clearly, most people are now considering phones in the Rs 10k-Rs 20k band. Also interesting is the fact that about 11 percent respondents said that price doesn’t matter for them, and they’d just choose the best phone money can buy. Younger people generally prefer cheaper phones. Men generally prefer pricier smartphones as compared to women. Almost 80 percent of respondents use online channels (gadget sites, eCommerce sites, YouTube) to research their smartphone purchase, regardless of whether they plan to buy online or offline. When it comes to getting more info on smartphones they’re interested in, about 44 percent respondents refer to gadget websites, 22 percent use e-commerce websites, 20 percent prefer visiting offline stores, 11 percent favour YouTube videos, while 3 percent consult with friends and family. 44 percent of all respondents said they would prefer to buy a phone online, while 40 percent would prefer offline, and 16 percent are unsure. However, if their phone of choice costs Rs 1,000 more offline, 60 percent of people will prefer buying online, while only 23 percent will buy offline. People in the South and East prefer buying smartphones online, while those in the Northern and Western states of India prefer taking the offline route. Women are more likely to buy smartphones online than men. Choosing a new smartphone isn’t an easy task, given the sheer number of choices available. We quizzed users on the aspects that matter the most to them when they go about selecting a new smartphone, focusing on vital parameters like performance, camera capabilities, battery, design and display. Not surprisingly, almost 60 percent respondents said that instead of focusing on a few aspects, they’d prefer a well-rounded smartphone that ticks most boxes. A significant 17 percent said they consider performance as the most important aspect, while 10 percent said the camera capabilities of a smartphone are of utmost importance to them. 8 percent users laid emphasis on the battery, 4 percent on design, and 2 percent on the display. When analysed by demographics, it appears that younger people give more weight to performance and camera capabilities, while older users focus more on battery and display. Splitting the data based on gender, the men prioritise performance over other parameters, while women lay more emphasis on camera, battery and design. While figuring out how people choose smartphones and the various aspects they consider while buying one, we realised that it’s also important to drill down further, and check how they evaluate crucial factors like performance and camera. This threw up some very interesting insights. For one, processor brand turned out to be the most important factor for users while evaluating the expected performance of a new smartphone. Almost 43 percent respondents said they consider the processor brand to be the most important criterion for performance, while 27 percent said they’d look at RAM capacity. 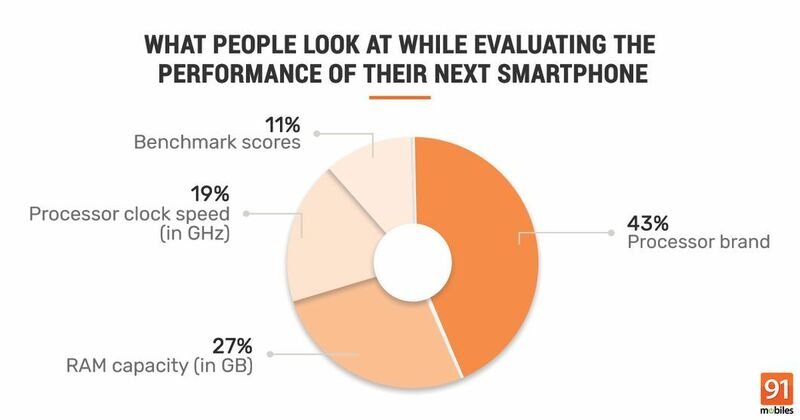 For 19 percent users, the processor clock speed is most important, while just 11 percent said they’d look at benchmark scores for judging the performance of a new phone. When it comes to evaluating camera capabilities, 34 percent respondents said they consider camera resolution as most important. 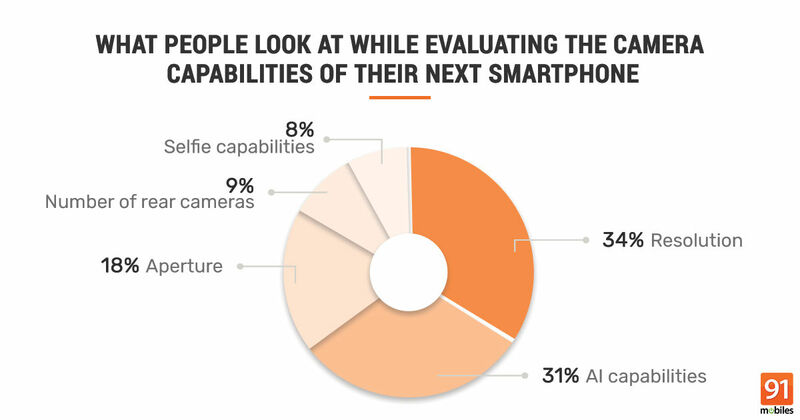 A significant chunk (31 percent) said they look at AI capabilities, and this is interesting as AI has come up as a recent addition to the camera features on smartphones. 18 percent feel the aperture is most important for smartphones cameras, 9 percent consider the number of rear cameras, while 8 percent said they’d just focus on the selfie capabilities. Younger people pay more attention to processor brand and benchmark scores, as compared to older users who focus more on RAM capacity and processor clock speeds. Women consider RAM capacity important, while men tend to look at other parameters like processor brand and benchmark scores. The number of rear cameras and selfie capabilities are more important for younger people, while the older folks consider AI features more important. Women care more about selfie capabilities than men (16 percent of women cited that as the primary factor for judging camera quality, vs 8 percent of men). On the other hand, men tend to focus more on aperture and number of rear cameras. We also asked users about the latest and upcoming smartphones and the ones that interest them the most. 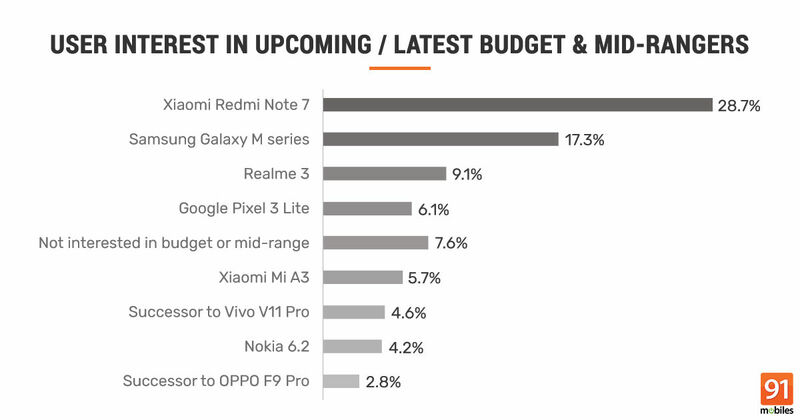 Among those who prefer affordable smartphone or mid-rangers, the Xiaomi Redmi Note 7 got the most number of votes (28.7 percent), followed by the Samsung Galaxy M series (17.3 percent) and the Realme 3 (9.1 percent). 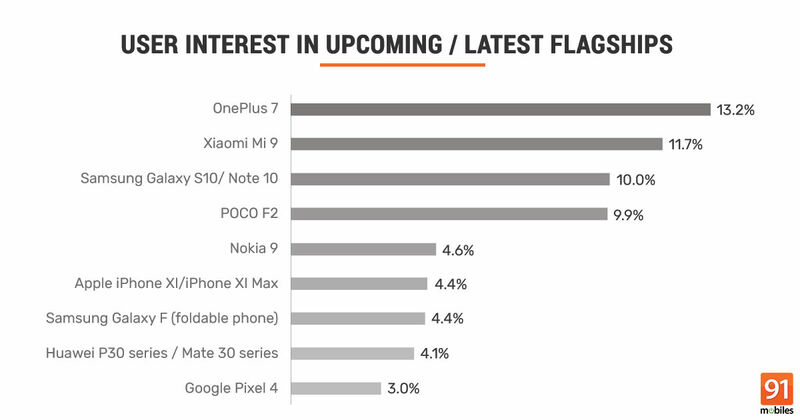 Among flagship phones, the OnePlus 7 garnered the most interest with 13.2 percent votes, while the Xiaomi Mi 9 got 11.7 percent. The Samsung Galaxy S10 range got 10 percent votes, with the (rumoured) POCO F2 got a shade lower at 9.9 percent. The above findings, we hope, should act as points of reference for smartphone brands to follow, and help take these companies a few steps closer to the Holy Grail – a satisfied set of customers. Watch this space for more of these insights.